Rachel first noticed her hair was thinning after her first husband left her shortly after their second child was born. Despite finding love again and having two more children, her hair continued to disappear and she started to hate going out. Now she revels in her new look and confidence after having an Intralace System fitted. 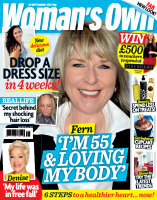 She tells her story to Woman’s Own magazine. As a new mum, I could not have felt happier. Here I was with my precious baby girl, Alana. I already had a gorgeous son, Zak, two, and a terrific husband, Tom, as well as a lovely home. I enjoyed juggling Alana’s routine with caring for Zak. Then one night, when Alana was three months old, I came down from settling the children and saw Tom staring out of the window. I was about to ask what he wanted for supper when he suddenly said, ‘I don’t love you any more. I’ve seen a solicitor and I want a divorce’. I couldn’t speak for shock. Then I pleaded with him to explain but Tom just got up, packed a bag and went. When the door closed after him, I broke down sobbing. It was January 1998 and we'd been married for three years. How could he have left me, and how was I supposed to care for the children on my own? For the next few weeks, I ran on autopilot. Then the fog of my despair began to clear, I hired an au pair and got a job working with young offenders. One day, getting ready for work, I noticed that my shoulder-length hair seemed thinner on top than normal. I brushed it the other way and put it out of my mind. Life carried on. It was hard but I learnt to cope. A year later, I even fell in love again. Simon, then 24, was a colleague and we both got on so well, and the kids adored him too. In 2002 we married and had a daughter, Izabel, in 2004, followed by Joshua 16 months later, before moving from Surrey to Somerset. Everything seemed to be going well but one night, glancing through old photos, I realised just how much my hair had thinned. My scalp was now showing through in ugly patches. Deeply self-conscious, I started wearing hats when I went out. ‘You’re beautiful,’ Simon kept reassuring me, but I definitely didn’t feel it. A woman’s feminity is wrapped up in her hair, and mine was disappearing. I went to see my GP, who explained hair loss can be triggered by shock and I thought back to when I’d first noticed it thinning, after Tom had left. ‘But I’m afraid there’s nothing we can do,’ the doctor said. Disappointment thudded deep in my stomach. I was so self-aware it was crippling my life. Then, in April 2009, my mum phoned to tell me to watch a TV programme about a woman who, like me, had suffered hair loss and been fitted with a revolutionary new form of extensions. As I stared at her new, thicker hair, hope rose inside me. ‘I want to give them a try,’ I told Simon. The extensions had been done at the Lucinda Ellery Hair Loss Consultancy clinic in London. So three months later, I travelled to meet Lucinda, who explained how the extensions were made of real hair and would be woven through a fine mesh attached to my scalp. Six weeks later, I had them put in. The process took nine hours and cost £1,800, which I paid for with my savings. When I saw the finished results, I was shocked - having so much hair felt odd. But back home, Simon and the children reassured me I looked great and gradually I got used to my new appearance. Now I love my hair. It’s totally transformed my life, and made me feel confident again. I can wash and style it myself but the extensions need checking every six weeks, which costs more then £2,000 a year. They also need replacing every two years. The cost worries me but Simon says he thinks of it as just another household bill. Because thanks to the extensions, he's got his wife back. Finally, I’m happy again.